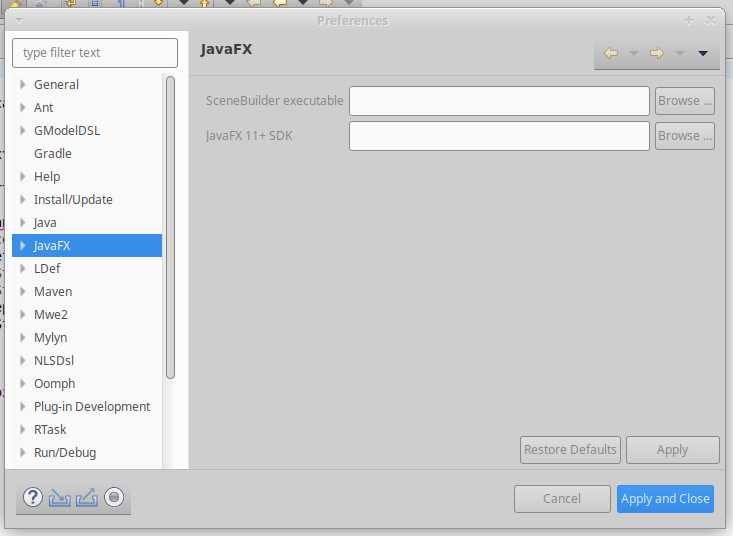 JavaFX setup in Eclipse: the option “JavaFX 11+ SDK” is for what? Trying to setup eclipse (2019-03) to develop with JavaFX 11. Have found several tutorials, but none of them explains what is this box (JavaFX 11+ SDK) in the window -> preferences -> javafx dialog (the same we setup the scenebuilder executable). Does anybody knows what is this for? Thought that I should only put here the folder where the Java11 SDK is, and all will work fine... but this is not the case. Thanks in advance. Best regards! Browse other questions tagged eclipse javafx-11 or ask your own question. How to add JavaFX runtime to Eclipse in Java 11? How do I properly setup JavaFX for Eclipse Mars?